1880s autograph album of George F. L. Cooke of Salem, Massachusetts. 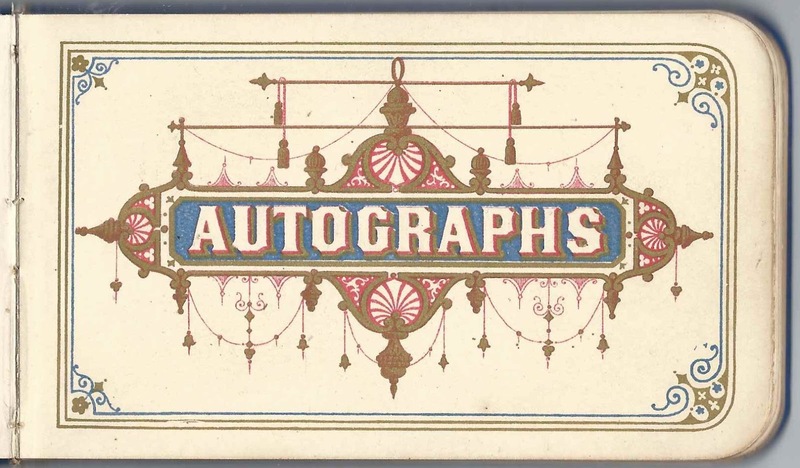 The album is approximately 5" x 3" and contains 18 pages signed by friends and, possibly, relatives. An alphabetical listing of the signers appears at the end of this post. I found a George Frederick Cooke from Salem, Massachusetts, who was born at the Chincha Islands off Peru, on 11 February 1866, son of George F. Cooke and Abby A. (Andrew or Andrews), born in Great Britain and Boston, Massachusetts, respectively. Whether this is the same person or not, I don't know; the extra initial L is a mystery. Maybe the L got dropped in the official records. Or maybe the person I'm about to describe is not the owner of the album. Hopefully a reader will set the record straight. The Chincha Islands at the time were a valuable source of guano. George's birth, and that of his older brother Edward in 1865, occurred during a time of hostilities between Spain and several western South American countries, as Spain attempted, ultimately unsuccessfully, to regain a foothold in South America. 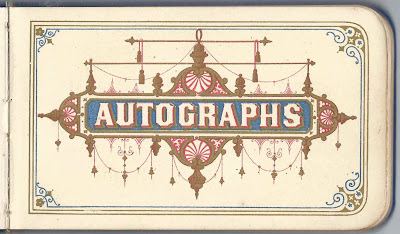 Perhaps trade with New England, perceived neutral and a valuable consumer, went on during the conflict. The death record of George's mother, Abby (Andrew or Andrews) Cooke, shows her parents as Nathaniel and Abby (Durgen or Durgin) Cooke, who were born at Salem, Massachusetts, and Sanbornton, New Hampshire, respectively. I'm speculating here but based on the birthplaces of George and Edward off Peru, and of their brother Harry R. Cooke, who was born in Ireland, it seems likely that their father George F. Cooke was a sea captain. The brothers' maternal grandfather, Nathaniel Andrew, also made his living on the sea. On the 1860 Census of San Francisco, California, where Nathaniel and his family, which included young Abby (Andrew) Cooke, were enumerated, his occupation was listed as Master Mariner. 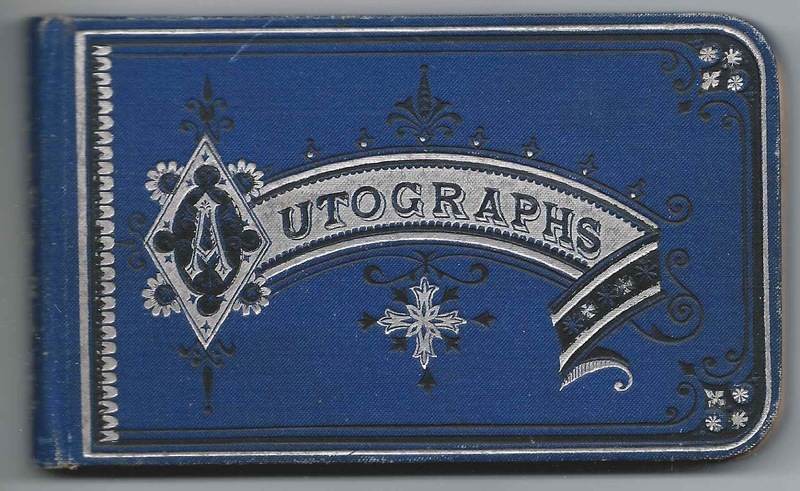 As seen in the second image above, the album was presented to George by Harry. 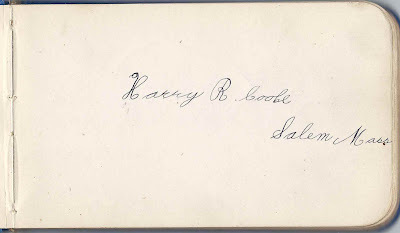 If that Harry were George's brother, the inscription was written by someone else, as the handwriting is different from the handwriting on a page that Harry R. Cooke signed himself. 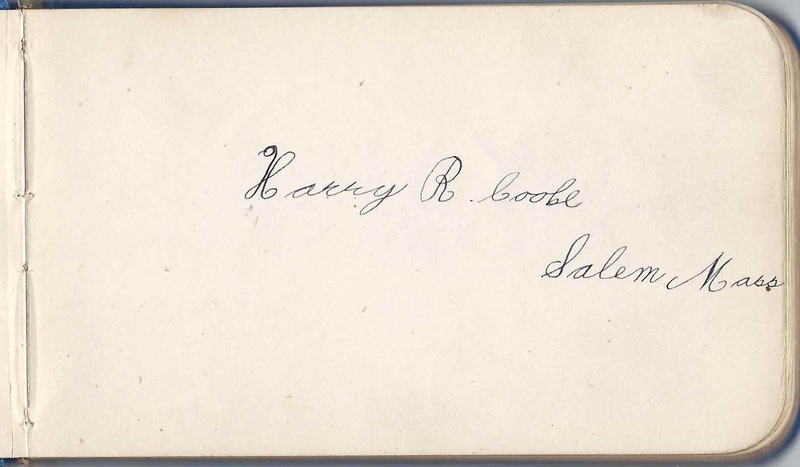 Sadly, Harry died in his late teens on 20 July 1888 at Salem. 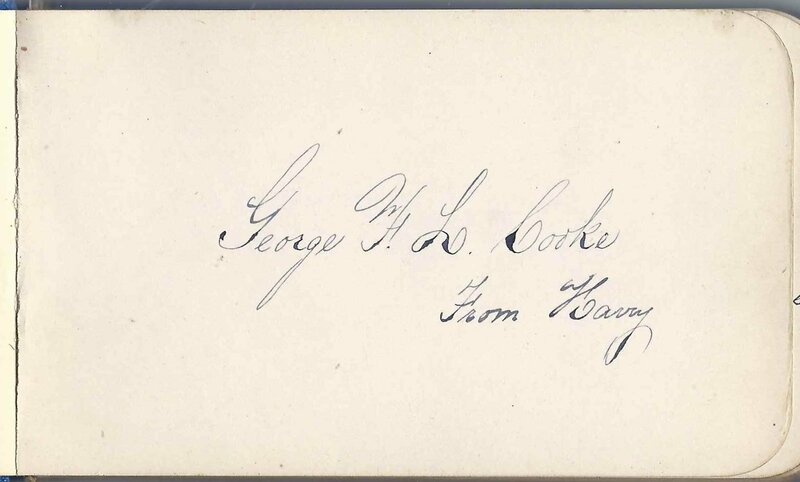 An Edward Cooke of Salem, Massachusetts signed a page in 1880 and called himself George's friend. 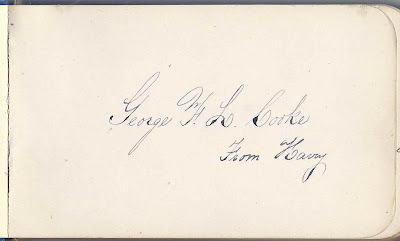 Could he have been George's brother Edward M. Cooke? 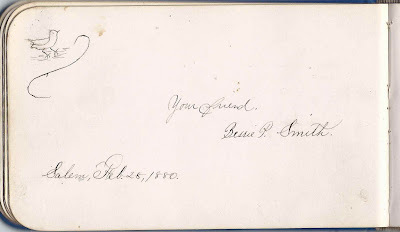 On 6 June 1893 at Salem, Massachusetts, George Frederick Cooke married Mary L. Daniels, daughter of William F. and Emily Jane (Ferguson) Daniels. George and Mary raised a family of three children at Salem, Massachusetts, and Manchester, Massachusetts. I found an obituary for George Frederick Cooke on a Masonic history website. He died in 1929 at Manchester, Massachusetts. 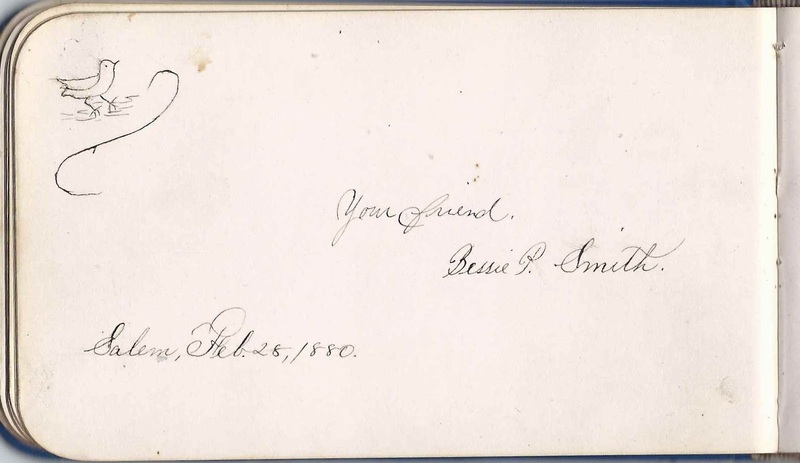 Three signers drew sketches. 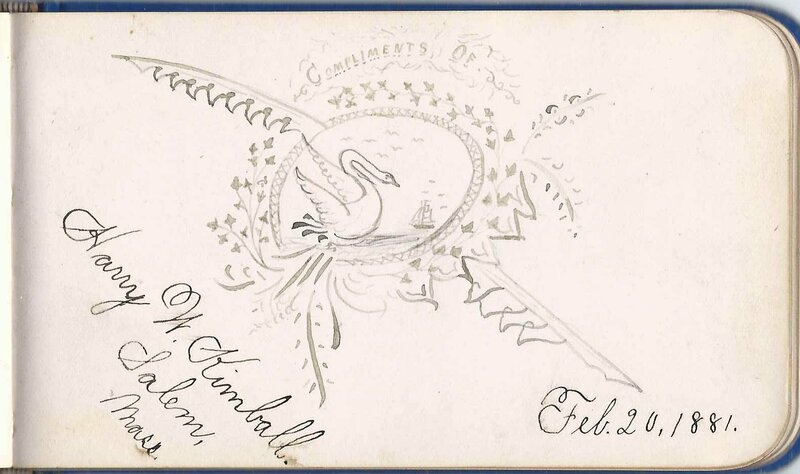 One was drawn by Harry W. Kimball of Salem, Massachusetts, in 1881. 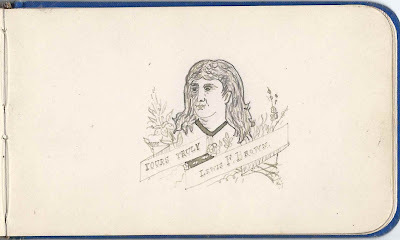 Lewis F. Brown drew a sketch but didn't give his residence or date his sketch. 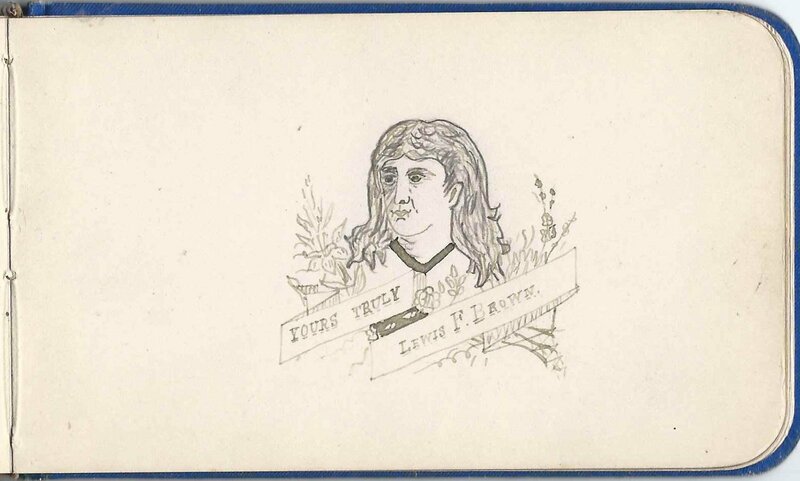 However, there is a Lewis F. Brown, born about 1861, listed in the 1880 Census of Salem, Massachusetts. 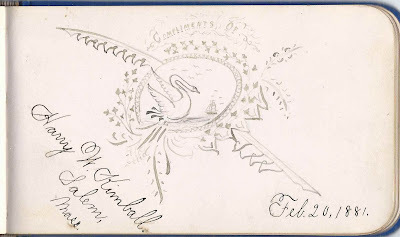 Bessie P. Smith sketched a bird when she signed a page at Salem, Massachusetts in 1880. 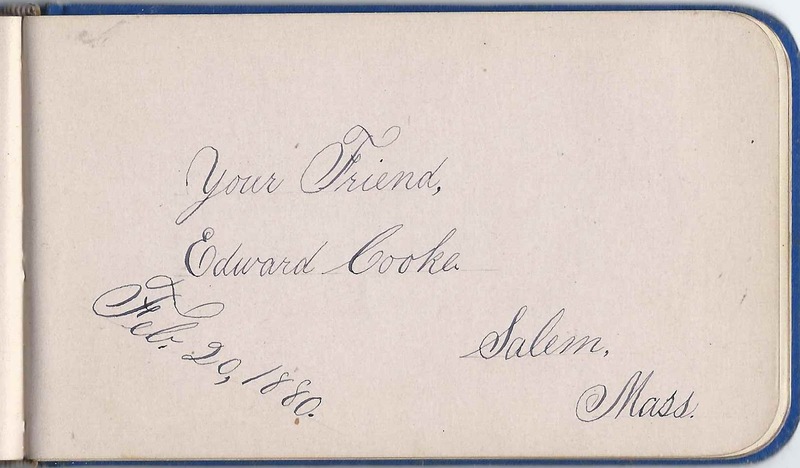 Edward Cooke of Salem, Massachusetts, 1880; friend. 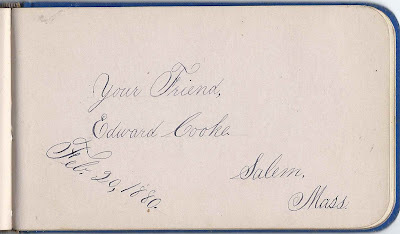 If Edward were the brother of George F. L. Cooke, would he have referred to himself as "friend"?